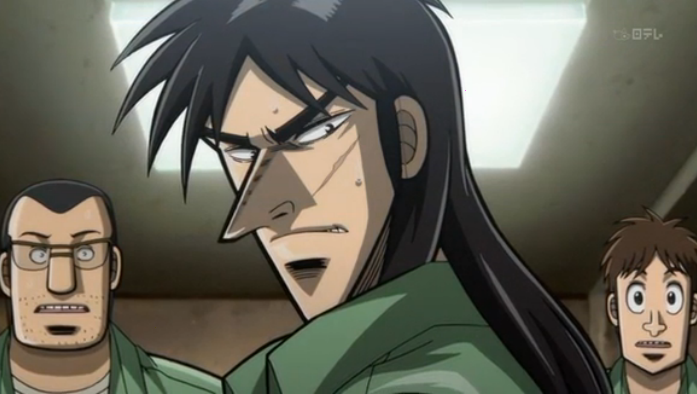 Kaiji throws some attitude around. This post covers episodes 5 and 6 of season 2 of Kaiji. I really only have a couple of comments to make, so let’s get straight to it. While Kaiji and the others sleep in the dirt of their underground prison, others look on from luxurious quarters. For the first time we get a peek at the reality outside of the prison. We knew Kaiji and the others were under constant surveillance, but we finally get to see those watching the show. 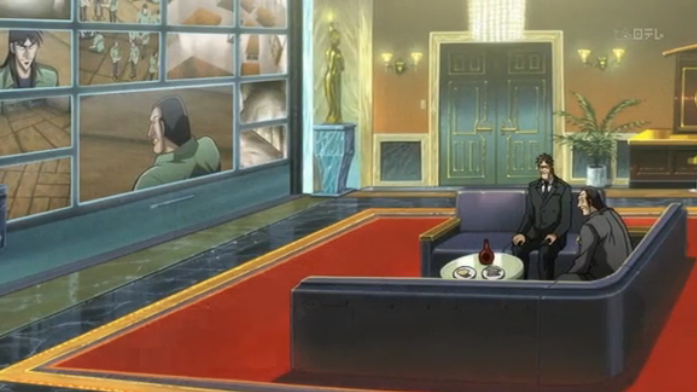 In this case we are introduced to Yoshihiro Kurosaki, who enjoys a drink in the opulent setting shown above, as he laughs at Kaiji’s determination. As Kurosaki correctly realizes, life in the prison has not broken Kaiji’s spirit, instead he is getting ready to take down the alpha dog. I've been waiting to see this expression on Ohtsuki's face since episode one. This dude really deserves to be taken down, and Kaiji has a plan to do it. Of course, along the way, Ohtsuki still does what he can to make Kaiji and his fellow “losers” suffer. When Kaiji finally comes up with a plan, it usually is surprisingly well thought out, and often requires a lot of preparation. His plan to take down Ohtsuki is no exception. He and his fellows work for over a month, just to save up the money to finance the scheme. Then Kaiji suckers Ohtsuki into a game of chinchirorin with a crucial modification to the rules: no limit on the bet. He even knowingly loses a lot of money, so that he can position Ohtsuki in the position of dealer. My guess is that Kaiji will break Ohtsuki in the next episode, and will move on to a new opponent for the remaining episodes. My guess is based, in part, upon the appearance of the watchers, such as Yoshihiro Kurosaki. At any rate, I’m looking forward to seeing Ohtsuki get stomped in the next episode; he really deserves it. 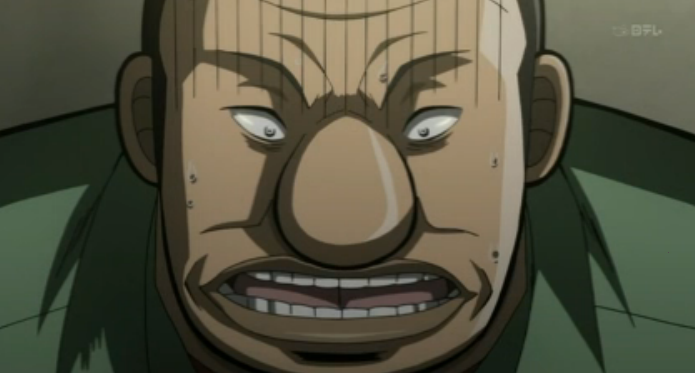 You know, sans the glasses Ohtsuki has a striking resemblence to another fat, slimy and treacherous character from Kaiji.. . I don’t know who you are talking about. Of course everybody in Kaiji’s universe is ugly and evil, so the problem is more too many to choose from, than not enough.